Gerdur is a Nord lumberjack in Riverwood. She runs the mill with her husband, Hod, and they have a son, Frodnar. Her family founded Riverwood, and has lived there for many generations. She is the sister of Ralof, and, like him, a staunch Stormcloak supporter. She holds some low level items in her inventory, which you can take if you went with Ralof and you ask her for assistance. She wakes up at 7am and goes to the mill to start her workday, which lasts for 12 hours. She returns home at 9am, 10am, and 11am for half an hour, then goes back to her worksite. At noon, she has a one-hour lunch back home. She visits the local blacksmith, Alvor, at 2pm for half an hour. At 3pm and 4pm she again returns home for half an hour. At 7pm her workday ends and she heads back home to eat dinner for one hour. She goes to bed at 10pm. She wears farm clothes, boots and gloves. She carries the key to her house as well as common items and gold. She wields an iron dagger. She can be found offering you work at the mill, saying things like "New to Riverwood? If you're looking for work, go see Hod at the mill." and "I own the lumber mill, and pay a fair wage. See my husband Hod if you're looking for work." She may also say, "We're a small village, but we work hard, and take care of our own. ", "Only worry we've got is the war reaching this far. ", "Years past, the lumber was used for houses or furniture. Now, the soldiers just buy it all. ", "The thought of my wood being used for weapons... Makes me sick. ", or "No use thinkin' of things I can't change. 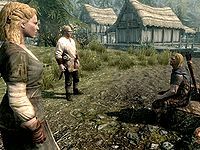 Too much work to be done..." If the quest The Golden Claw has not been completed, Gerdur may also inform you, "Lucan over in the Riverwood Trader says thieves broke into his store. Strange, he says they hardly took anything." 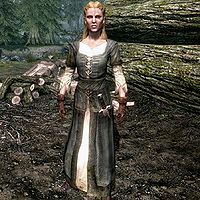 Asking her what she can tell you about Riverwood will have her reply, "It's my mill. Some folks think it's my town too, but it ain't. The Jarl in Whiterun owns the land and the town. I just pay the taxes." You can also ask her where you can buy fresh supplies. She'll answer sarcastically, "And by 'supplies' I suppose you mean weapons and armor. Alvor can help you out. He's our blacksmith." Gerdur: "Can the sawmill handle those logs? They look a might big." Gerdur: "Are those parts ready yet?" Alvor: "I can only hammer so fast, Gerdur." Gerdur: "They don't have to be perfect. Just send them over when they're ready." 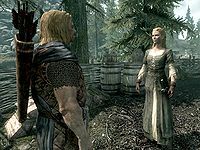 Gerdur may turn hostile when you fast-travel to Riverwood. Killing her will not result in any bounty. This page was last modified on 5 March 2019, at 02:14.